Altitude0: Lower & Faster is about flying at a frighteningly low altitude while keeping your speed up. The lower you fly, the faster you go and the better A0 pilot you become. 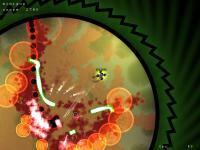 Annihilation is an arena shooter that is inspired by Geometry Wars. 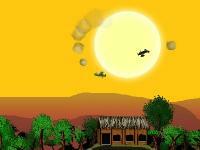 Just shoot stuff, use your bombs in tight situations and survive. Arc Aether Anomalies is a six-degrees-of-freedom (6DOF) arcade action shooter inspired by such titles as Descent, Geometry Wars, and Every Extend Extra, and visually influenced by Innerspace, Metroid Prime, House M.D., flOw, and electron microscopy. The Xbox 360 controller is currently supported, as well as WASD/mouse. Asteroids is a 3D game by Michael Davies, based on the old arcade classic in which you must destroy asteroids by breaking them up into smaller pieces. It was developed in Visual C 6.0 with DirectX 8.1 over a period of approximately two months. It will run under any Windows system with DirectX 8.1 and a 3D accelerator card. 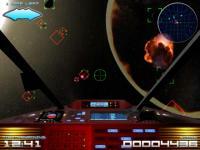 Bitfighter is a free multi-player 2-D space combat game with Robotron-like controls. It's a team-based strategy game featuring retro vector graphics and customizable ships. It's fast, fun, and frenetic. Bitfighter is designed for Windows, Linux, and OS X, and has an active development team. 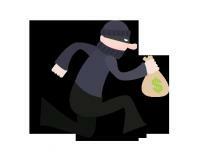 Typical Breakout clone. destroy the bricks to progress to next level, Collect powerups, 50 maps, Written in less than 2 days. Bomb Buddies is a fast-paced 3d free-to-play game! Bomb Buddies currently has 8-player simultaneous multiplayer sessions across 120 levels, 7 themes, and 8 game modes. Characters are fully customizable! Balanced Worlds is adding additional action-packed game modes, a myriad of power-ups, awesome devices, and a whole lot more. A classic Bomberman game with multiplayer support, cloned on original SNES games. Also similar to Dynablaster. Developed in C . Runs on Win32 and Linux. C:Medieval is a 100 player online arcade game. Up to 4 players can play on one PC whether it is a server or client. Cobex is an arcade game with abstract neon graphics where you have to colorize grids with your speedy ship. Avoid the enemies and score combo points on your recoloring mission! 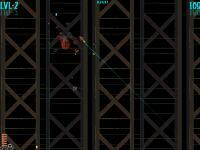 Debrysis is an arena shooter, in the style of Robotron and Mutant Storm.